A personal injury attorney does more than represent your case in court. Our car wreck attorneys will help you determine who is liable for your injuries, what kinds of insurance claims to file, what damages you deserve compensation for and other important factors of your case. We will also deal with the insurance companies for you; the legal team at Juan Hernandez Law know how to work with the insurance companies so that they can’t manipulate you into receiving less compensation than you deserve. Every year, over 2.5 million people are injured in auto accidents in the U.S. alone. These automobile accidents range from minor fender benders to serious head-on collisions that leave victims with life-threatening injuries. After you get in a car wreck, it’s important that you seek legal representation immediately. At Juan Hernandez Law P.C., our experienced personal injury attorneys have extensive experience working with victims of car accidents. You need to receive the full compensation for your injuries, vehicle damage, and other damages so that you won’t be burdened with financial hardship after your accident. In addition, you deserve to be compensated for the pain and suffering that you endure during and after the accident. The attorneys at Juan Hernandez Law have a proven track record of winning clients full compensation for their damages, and we’ll make sure that you get the ideal outcome for your case. Contact us today if you’ve been injured in a car accident. Move your car (if you can do so safely). It’s much more important to move off the road than to stay exactly where the accident happened. This will keep both you and other drivers safer. Of course, if you can’t move your car after the accident due to extensive damage or your injuries following the wreck, don’t worry about moving the car. In either case, make sure to turn on your hazard lights. Check on the other driver and passengers. It’s important to make sure that no one is seriously injured after the wreck. If anyone is (including yourself), immediately call an ambulance. Call the police. Once you’ve moved to safety and checked on everyone, it’s time to call the police to file a report. Gather information about the crash. As you wait for the police to arrive, you should gather as much information about the car crash as you can. This will help you when you’re making a car accident police report. This information may include the names of drivers and passengers, license plate numbers, the insurance information of the other driver, makes and models of the vehicles, witness statements and contact info of any witnesses, and the location of the accident. Take pictures of the accident scene. Use your phone to document all damage after the vehicle crash. Call an attorney. Many people think that the next step is to call their insurance company. However, insurance companies are notorious for twisting words around and giving people as little money as possible for their accident. The attorneys at Juan Hernandez Law will be there to help you get the full amount you deserve from both the other driver and the insurance company. Visit a medical professional. After an accident, you should always see a doctor to document your injuries. Even if you think you don’t have any injuries, you should still go to the hospital because certain injuries (such as traumatic brain injuries) don’t manifest right away. After a car accident, it’s best to file your report with the officer reporting to the scene. In some cities, however, you also have the option of filing the report after the fact at the Texas Department of Transportation. If the damage is minor, you’re not legally obligated to file a car accident police report. 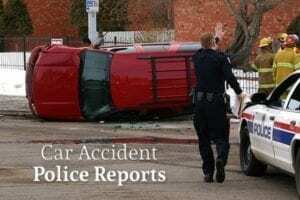 Remember that filing a car accident police report in Texas does not force you to file an insurance claim, so you should file a report even if you and the other driver are considering a settlement without involving the insurance company. Negligence, or Direct Liability. The most common cause of car accidents is negligence (also known as direct liability). When another driver operates their vehicle in an unsafe manner, their negligence may cause you to get into a car accident. Whether they’re speeding, following too closely, not paying attention, or engaging in another negligent behavior, they’re liable for your damages. Respondeat Superior. Respondeat Superior is the theory of liability that holds employers responsible for the actions of their employees. If you’re struck by an 18-wheeler, a crane, or company vehicle, you may be able to hold both the operator of the vehicle and their employer responsible for your damages. Product Liability. In certain cases, a faulty vehicle or part may contribute to or cause your accident. Faulty parts may also cause an increase in injuries, such as in the case of airbags not deploying. In these cases, the vehicle manufacturer may be held wholly or partially responsible for your car accident. Damage to property. You deserve to be compensated for any damage to your vehicle after you are in a car accident. In addition, you may also be able to receive compensation for any objects in your car that are damaged in the vehicle wreck. Medical bills. You’re likely to incur injuries after you’ve been in a car wreck. These injuries can lead to thousands of dollars in medical bills, which you deserve to be recouped for. Income loss. As you recover from the injuries you sustain from a vehicle accident, you may lose income, which you deserve compensation for. Pain and suffering. 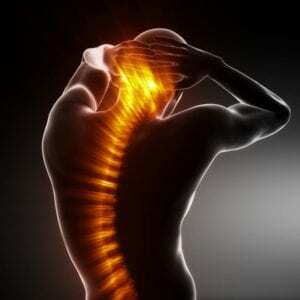 Pain and suffering damages include any kind of physical or mental suffering that you experience after an accident. Punitive damages. In some cases, you may be entitled to punitive damages after a car wreck. These damages are designed to punish the entity or individual that caused your wreck for their reckless or negligent behavior. Mental anguish. If a loved one is killed in a car accident, you may be entitled to compensation for the mental anguish that you suffer. Optional insurance that you should consider includes collision coverage, comprehensive coverage, uninsured motorist protection, and personal injury protection. According to data collected by the Texas Department of Transportation, Texas saw 422,695 car wrecks in 2017, which averages out to about 1,158 wrecks per day. 3,342 of these crashes were fatal crashes, which means that 8 out of every 1000 crashes led to death. In total, 122,352 car accidents occurred within the Dallas/Fort Worth Metroplex, which is 29% of the total number of accidents in Texas. Dallas County was the most accident-prone city, with 20 accidents per 1,000 people and 50,627 vehicle crashes overall. Collin County was the safest, with 13 car wrecks per 1,000 people. 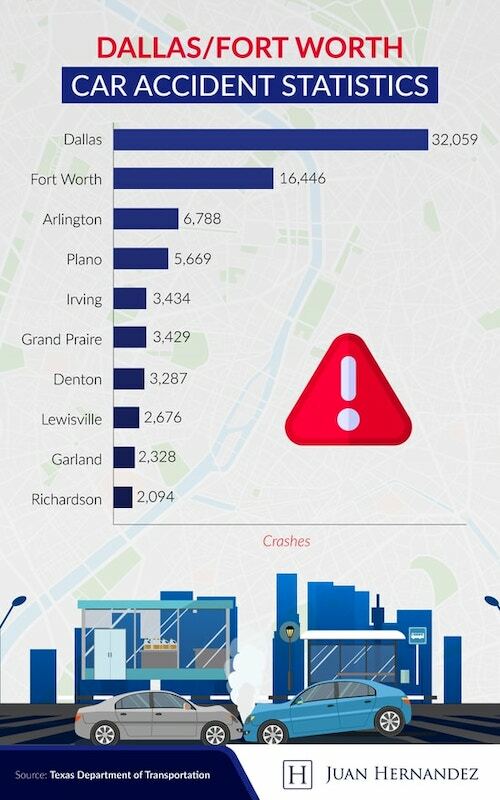 Arlington with 117 drunk driving accidents per 100,000 people. Mesquite with 114 drunk driving accidents per 100,000 people. Dallas with 97 drunk driving accidents per 100,000 people. Grand Prairie with 78 drunk driving accidents per 100,000 people. Fort Worth with 67 drunk driving accidents per 100,000 people. Garland with 54 drunk driving accidents per 100,000 people. 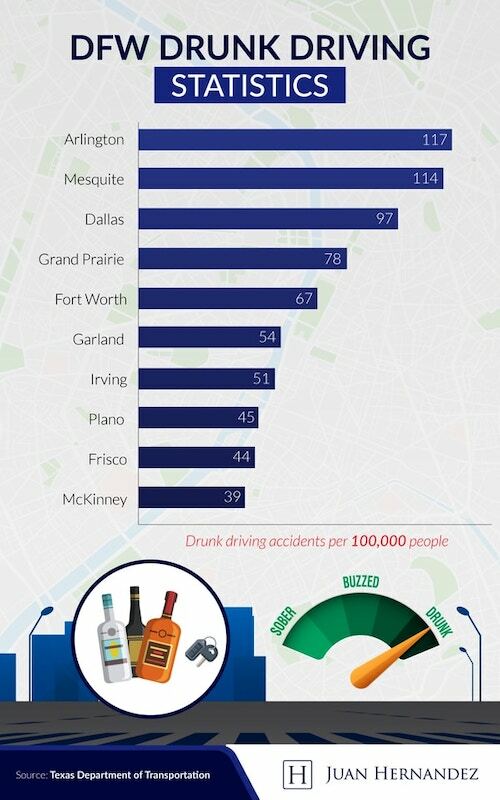 Irving with 51 drunk driving accidents per 100,000 people. Plano with 45 drunk driving accidents per 100,000 people. Frisco with 44 drunk driving accidents per 100,000 people. McKinney with 39 drunk driving accidents per 100,000 people. Close to 24% of the total DUI accidents that occurred in Texas were in the DFW area. If you’ve been in a car accident, contact our team at Juan Hernandez Law P.C. Juan Hernandez is one of a small percentage of lawyers in Texas who are board-certified in personal injury law. Because of this, you can trust that he has the experience to win your case. Contact us today to schedule your free car accident legal consultation. We have law offices in Dallas, Amarillo, and Abilene.